JFL 2006 title winners Honda FC confirmed their championship triumph by defeating company rivals Honda Lock 2-1 in the final day of the league season on Sunday - but they needed to come from behind to do so. 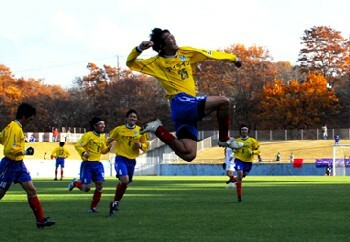 Lock, who finished bottom of the table and will need to play off against Tokai League side FC Gifu to retain their place in the JFL for next year, took a sensational lead through Kazumasa Asami just before the interval, only for Junya Nitta to level things up mid-way through the second period. 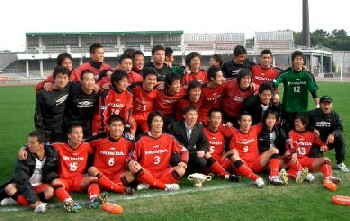 Masayuki Ishii netted the winner for Honda in the dying moments. Sagawa Kyubin Tokyo and Sagawa Kyubin Osaka have now ended their JFL lives as separate clubs before amalgamation during the forthcoming close season. It has nevertheless been a superb campaign for the corporate sides, who finished second and third. Tokyo rounded off the year with a somewhat disappointing home draw against FC Kariya, while Osaka overcame Rosso Kumamoto thanks to Ryoji Nakano's twentieth-minute effort. That loss for Rosso meant that they ended up in a disappointing fifth position, overtaken on the final day by YKK AP, for whom Daisuke Asahi scored the only goal of the game in injury time against JEF Club. The other teams in the top group were YKK's local rivals Alo's Hokuriku - who drew 0-0 with FC Ryukyu - Yokogawa Musashino and Tochigi SC, victors over lowly Sagawa Printing and Mitsubishi Mizushima respectively. Indeed, Kenta Nagai's 86th-minute goal for Tochigi was partly responsible for Mitsubishi slipping back down into the bottom two, given that Ryutsu Keizai University were able to notch up a 2-0 win at a Sony Sendai side who have endured a horrendous second half of the season. Finishing the year locked in mid-table alongside Sony are Arte Takasaki and SC Tottori, who rounded off their seasons with a 2-2 draw.